With summertime being what it is (called komkommertijd—literally: ‘cucumber time’—in Dutch), I stumbled again upon the paper The nonequilibrium nature of culinary evolution . Food is essential, and due to location with its climate and available resources, as well as culture, each region has its own cuisine. There is much talk of homogenization of food dishes in popular press, or at least the threat thereof. One colleague here called “food from the North”, north of the Alps, that is, “barbarian”. But how much diversity in recipes across geographical locations is there? How, if at all, does it vary over time? What is the ingredient replacement pattern and do the replaced ingredients really disappear from the local menu? Kinouchi and colleagues  tried to answer such questions through assessment of the statistics of the recipes’ ingredients, which were taken from 3 complete Brazilian cookbooks (Dona Benta 1946, 1969, and 2004), 40% of the large contemporary French cookbook Larousse (2004), the complete British Penguin Cookery Book (2001), and the Medieval Pleyn Delit. For instance, the average recipe size of the Dona Benta (1946) as measured by ingredients, is lowest at 6.7, that of the Pleyn Delit an impressive 9.7, and of Larousse the highest with 10.8. However, one has to note that for the Pleyn, there are just 380 recipes with a mere 219 ingredients, whereas the numbers for Larousse are 1200 and 1005, and for the Dona they are 1786 and 491, respectively. When one makes a graph the frequency of appearances of ingredients in the recipes in the cookbooks, then all six cookbooks show very similar rank-frequency plots (power-law behaviour; see Fig. 1 in the paper); that is, for that dimension, there is a cultural invariance, as well as a temporal invariance for the Brazilian cookbook. However, the more interesting results are obtained by the statistical and complex network analysis to obtain an idea about culinary evolution. The authors propose a copy-mutate algorithm to model cuisine growth, going from a small set of initial recipes to more diverse ones and using the idea of “cultural replicators” and branching. To make the line fit the data, they need 5 parameters: number of generations (T), number of ingredients per recipe (K), number of ingredients in each recipe to be mutated (L), the number of initial recipes (R0), and the ratio between the sizes of the pool of ingredients and the pool of recipes (M). Models without a fitness parameter did not work, so one is generated randomly and assumed to stand for the “intrinsic ingredient properties”, such as nutritional value and availability. At each generation, one “mother” recipe was randomly chosen, copied, and one or more of its ingredients replaced with other random ingredient (implementing the mutation rate L) to generate a “daughter” recipe. And so onward. Searching the parameter space, the authors do indeed find values close to the actual ones observed in the cook books. Then, on the fitness of the recipes (replaced by hamburgers, pizza, etc.? ), Kinouchi and colleagues use the fitness of the kth recipe, defined as , and a corresponding total time dependent cuisine fitness, . The results are depicted in Fig4 in the paper and, in short: “this kind of historical dynamics has a glassy character, where memory of the initial conditions is preserved, suggesting that the idiosyncratic nature of each cuisine will never disappear due to invasion by alien ingredients”. In addition, the copy-mutation model with the selection mechanism is scale-free, so that it is an out-of-equilibrium process, which practically means that “the invasion of new high fitness ingredients and the elimination of initial low fitness ingredients never end”, i.e., some ingredients are very difficult to being replaced, as if they were “frozen “cultural” accidents”. The latter has some similarity with the ‘founder-effect’ phenomenon in biology. That much for the maths and experimental data of the paper. Before I turn to some research suggestions on this topic, I will first make an unscientific informal assessment. 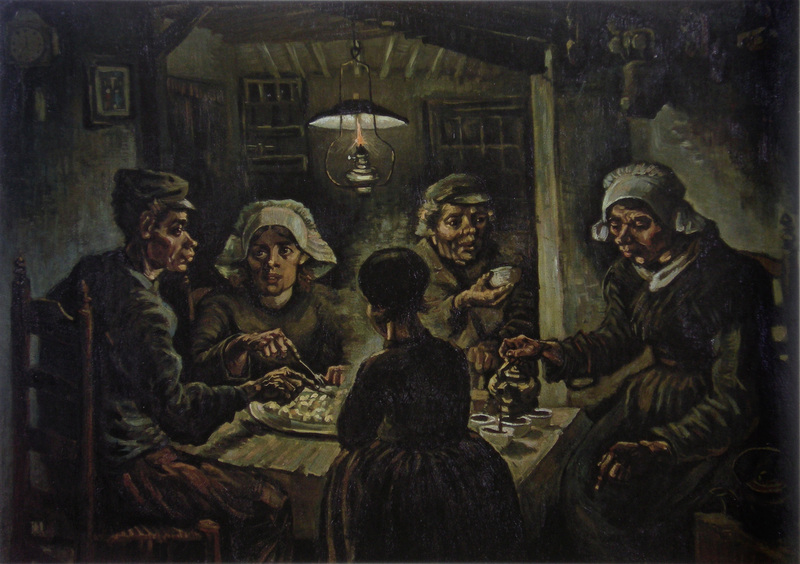 Van Gogh painted the painting de aardappeleters (‘the potato eaters’) in Nuenen—a village about 15km from where I grew up—back in 1885, to which Thieu Sijbers added a poem to describe such a poor man’s meal. I could not find the full original, but Van Oirschot (, p17) has the main parts of it, which I reproduce here first in the original old Brabants dialect and then a translation in English. as empty as it can be. with the meal after the potatoes. The coffee is probably not real coffee but made from roasted sweet chestnuts . The potatoes are an example of the “alien ingredients” mentioned in : before potatoes were introduced in Europe (16th century), the Dutch recipes, at least, used tubers such as pastinaak (parsnip, which are white, and longer and thicker than carrot) in the place of potatoes; this is known primarily from the documentation about the Siege of Leiden in 1573-1574 during the 80-years war. Parsnip has not entirely vanished (parsnip beignets are really tasty), but now takes up a minimal place in ‘standard’ Dutch cuisine, so that it may be an example of one of those “frozen “cultural” accidents difficult to be overcome in the out-of equilibrium regime” (, p7). A standard Dutch dish is the aardappelen-groente-vlees combination, or: boiled potatoes, boiled vegetables, and a piece of meat baked in butter or fat, or the potatoes and vegetables are cooked together and mashed together into a hutspot (= potato+carrot+onion) or boerenkoolstamp (= potato+curly kale). Over the years, pasta entered the menu as well, and primarily a combination of Chinese and Indonesian, but to some extent also Surinamese, food has become regular dishes. Thus, pasta and rice took some space previously occupied by potatoes, but potatoes are in no way being marginalised. My guess is that that is because tubers and grains belong to different food groups and are therefore not easily swappable compared to tuber-tuber replacement, such as parsnip → potato [note 1], or grain-grain replacement, e.g., maize[flower] → wheat[flower]. Simply put: if you grow up on rice or pasta, then you do not easily switch to potatoes, or vice versa. Perhaps Kinouchi’s copy-mutate algorithm can be rerun taking into account types of ingredients and then see what comes out of it; and use some variations like (1) swap within same food group, (2) different food group swap, pick random ingredient; and (3) keep the swap within subgroups, such as tuber-carbohydrate-source-staplefood#1 → tuber-carbohydrate-source-staplefood#2 (vs. the more generic ‘carbohydrate source’) and herb#3 → herb#4 (vs. the subsumer ‘condiment’). Further, in addition to ingredient substitution-by-import, one also observes recipe import, which faces the task of having to make do with the local ingredients. Chinese excel in this skill: dishes in Chinese restaurants taste different in each country but roughly similar—in Italy, they even split up the meals into primo and secondo piatti. But when substituting original ingredients with the local ingredients that are only approximations of the original ones, how much remains of the recipe so that one still can talk of instantiations of the dishes described by the original recipe and when is it really a new one? What effect do those imported recipes have on local cuisine? Is there experimental data to say that, statistically, one recipe is better “export material” than others are? Are people [from/who visited] some geographic region better at transporting the local recipes and/or their ingredients elsewhere? It remains to test whether those mutated recipes are still edible. Forced by ‘necessity’, I did ingredient substitution due to recipe import several times (the Italian shops do not have baked beans, no brown sugar, no condensed milk, no ontbijtkoek, no real butter, no pecan nuts, only a few apple varieties, etc…), and for some recipes the substitute was at least as good as the original, but then the substitute approximated the original. I certainly have not dared mashing together cooked pasta+carrot+onion to make an “Italian-style hutspot”, let alone random ingredient substitutions. In case someone has done the latter and it is not only edible but also recommendable, feel free to drop me a line or add the recipe in the comments. 2. van Oirschot, A. (ed.). Van water tot wijn, van korsten to pastijen. Stichting Brabanste Dag, 1979. 124p. [note 1] There is a difference between root-tubers (such as parsnip) and stem-tubers (such as potato), but functionally they are quite alike, so that for the remainder of the post I will gloss over this minor point. Some basic information can be glanced from the Wikipedia entry tuber, more if you search on Pastinaca sativa (parsnip) and Solanum tuberosum (potato) who are not member of the same family, and you may be interested to check other common vegetables and their names in different languages to explore this further. This entry was posted in Computer Science, cultural heritage, research reviews and tagged brabant, culinary evolution. Bookmark the permalink.